It's time for the Verve Divas to bring you our monthly Diva Inspirations Challenge and Blog Hop! There are two ways to win Verve prizes: comment on the design team's blog hop posts (linked below) to see their take on the inspiration, then go get inky and link up your take on the challenge to be eligible in our prize drawings! You have until March 5 to link up, so feel free to play as often as you like. The pop of color in this industrial style loft speaks of the hope of spring in the midst of winter. Kind of like February... it's still cold and wintry, but new life is on the horizon. Feel free to take your inspiration from the photo or the color combo, whatever suits your fancy! We can't wait to see what you create. 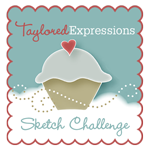 Challenge deadline: Saturday, March 5. Need a little inspiration? 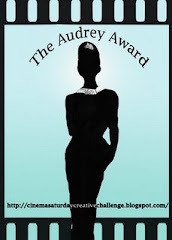 Check out the blogs linked below to see what the other Divas did with the challenge! It's sure to be a treat, and speaking of treats, we're giving away a $30 gift voucher to Verve to one random commenter along the hop! adding a little bling to the banner was a nice designer detail! The colors you chose make your card amazing! Your card is so pretty. I love the banner and the beautifully colored butterfly. Beautiful card, love the blinged banner too. Great card. Love the little flags. Wonderful card! Love all the layers! Wonderful layers and I love the little notebook sheets. I love the way you used the colors; very nice. Wow! I love where you went with the inspiration! Great card! This is a gorgeous card, with amazing colors too! Very uplifting! This is so pretty, Sankari! Love that sweet glossy butterfly and all your fabulous layers. Pretty color combo. I love that sentiment, too. 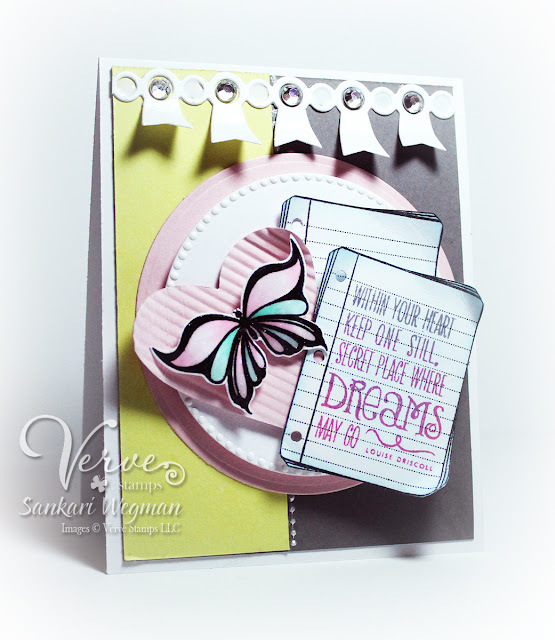 Awesome layering and color combo on this pretty card! Love the butterfly! Lovely card and such a beautiful butterfly. As Usual An Awesome job! I like it how you add an extra touch! Love the fun look of your card with its many layers, the textured heart, and ombre sentiment! Such lovely details - I especially adore the corrugated-paper heart! Your card is so pretty and cheery! The banner at the top is a sweet touch. I couldn't wait to see what you had made for this challenge and what a beauty it is. Sankari, there are so many wonderful things about your beautiful card that I love. I love the award banner die with the rhinestones and the soft colors, the sentiment and the beautifully colored butterfly. Thanks for the inspiration! Ah . . . beautiful! 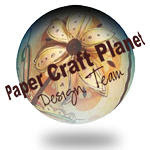 Love your fun layout and how you focused on the soft colors in the photo. Thanks for sharing your fantastic card. LoVe your pretty butterfly. Love your layers and colors. Loving that note pad and sweet sentiment! Adorable... the butterfly with the sentiment is a perfect compliment!